What are single phase and three phase connections? Most of us know that in the world of electricity, current through the wires carry electricity that light our bulbs and run our appliances. The type of current that is supplied from electricity grid is Alternating Current (or AC). In a single-phase supply, a single alternating current in supplied through a single wire, whereas in a three-phase system 3 wires carry alternating current with a definite time offset in between the voltage waves. In India a single-phase supply is a 230V supply through two wires and 3-phase supply is 415 V supply through 4 wires and in the house the line can be divided to give 230V at individual point. The basic difference between the two is that a three-phase connection can handle heavy load while a single-phase cannot. To give an analogy to help you understand the difference, let’s take an example of a highway. If the highway is a single lane highway, only a few two wheelers may go on it in parallel, or if we try to squeeze, we may put two cars running in parallel. But beyond that things will not move, whereas if we have a 3-lane highway, lot of vehicles can move together in parallel. Even on a single-phase highway, number of vehicles that can run together also depends on the size of vehicles. A car and a two-wheeler may easily go in parallel on a single-lane highway, but a truck may just have to be left alone. 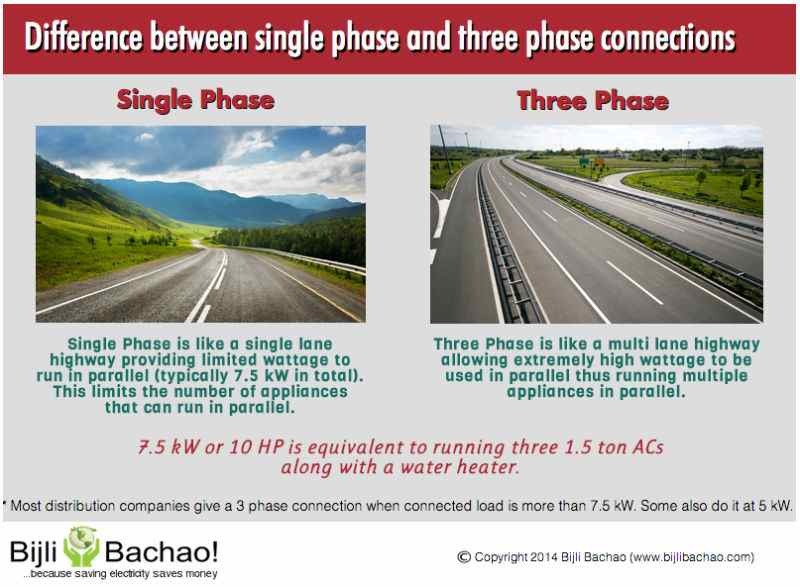 Similarly consider single-phase as a single lane highway and three-phase as a multilane highway. There is a limit to the load that a single phase can handle and typically that number is set to 7.5 kW (or 7500 watts or 10 Horse Power). So if sum of wattage of all the appliances that you are running at a time is more than 7.5 kW, then you need a three-phase connection. And you can get to 7.5 kW if you have three 1.5 ton ACs and a water heater all running together. Or you have a machine that has a motor that is more than 10 HP. If the load is less than 7.5 kW, then a single-phase connection can easily handle it. Note: A lot of people have misconception that Air Conditioners require three-phase connection. Which actually is not true because all ACs have motors designed to run on single-phase. Only if you have more than 3 ACs that are all in use together you may need a three-phase connection. But I have a three-phase connection and my electricity distribution company assigned me that? After reading the above explanation, a few people may think that I do not run so many ACs together, then why has my distribution company assigned me a three-phase connection? Well it is quite interesting to note, that in North America, as a rule three-phase connections are meant only for commercial and industrial connections and residential connections are always assigned single-phase connections. But in India we have observed with most distribution companies that if the residential connected load is more than 5-7 kW, they assign a three-phase connection to that house. And typically connected load is evaluated by assuming that a certain percentage of all the appliances in your house will run together. So if you have 3 ACs and few water heaters and even if you do not run them together, a three-phase connection will be assigned to you. The reason for that is, in case you run them together, it will have potential to bring down the electricity distribution system. Are there any benefits of three phase connection? The benefit that a three-phase connection provides is that it gives flexibility to divide the load in a setup on three different phases. So for example if there are three Air Conditioners, then each can be setup on each of the phase, thus not putting excess load on any one phase. In case one of the phases fails due to a fault at the distribution point, the other two phases keep running and this prevents complete blackout of the setup. So in your house, if you have three rooms connected to each phase, then even if one phase fails from the electricity distribution transformer, only one room will not have electricity, but the other two will continue running. Typically it is observed that if the connected load in a house is more than 5-7 kW, electricity distribution companies put a three phase connection in the house (to know more about connected load check this link: Impact of Connected Load on Fixed Charges in Electricity Bills). And obviously as it offers extra load, there are charges associated with a three-phase connection. First and foremost, as the connected load provided to the house increases, so the fixed charges on the electricity connection may increase. Also three phase meters are different from single-phase meters, so the meter needs to be replaced. In some states, utilities have monthly meter rent, whereas in others, there is an upfront charge for the meter. So the change of meter will cause either an upfront charge of changing it, or will change the meter rent on your bills. Some people believe that to change to three-phase connection, they need to change the wiring in the house. Please note that this is not required. Your existing wiring can handle the three-phase connection and there is no need to spend on changing the wires. Note: A change in connection from single-phase to three-phase will not increase energy charges on your electricity bill. So the number of units of electricity you consume will remain the same (because they depend on the wattage of your appliances and not on the electricity connection). Typically a residential connection should not require a three-phase connection, as most appliances that are used in a household do not need such a connection. But if there are a lot of heavy appliances in a house, then utilities might suggest going for a three-phase connection. Three-phase connection comes for an extra cost, so one certainly needs to evaluate if that is really required.